Front gardens are often an overlooked area of garden design, seen more of a necessity than a true garden space. An often wasted space that simply allows you to get to your house. Usually, it's somewhere to park a car, store wheelie bins, put empty milk bottles and a general thoroughfare to get to the front door as quickly as possible. Lock the world out after a hard days work and done; that's your front garden design consideration over. There's so much more you can do. However, there is another thought with front garden design. Why not turn this around and actually make it a space that greets you warmly as you come home, offers refuge, excitement, calm or invitation to your visitors? This guide will show you that you can have a functional, beautiful and environmentally sound space and it is really not that difficult to achieve! Whether you have the smallest of spaces or an awkward long front garden there’s a design solution for you. It will cover all the areas of consideration and also give some design ideas and examples. What’s wrong with paving over your front garden? First things first, your front garden is usually the main access route to your house, back garden and or garage. So when looking at your front garden you’re going to need to map out a sensible route to the front door. Taking into consideration whether you’re stepping out of a car so not to end up in a flower bed. How will you reach the front door? Whether this is a direct or indirect route and whether this access is obvious enough for postmen/women and general visitors. It’s usually good design practice to have an obvious route, whether it be a path or walkway that signals for you to follow it. Having to guess how to reach the door is a design fail and funnily enough, a number of gardens struggle to get this right. Gravel, pavers, cobbles, stepping stones, chipped bark or concrete are all good solid choices for such access routes, with some of these being more expensive than others. Consider the maintenance and whether the material is cohesive, ie blends well, with your property. Chipped bark may look lovely as a path to a thatched cottage, not so much as an entrance to a contemporary townhouse. 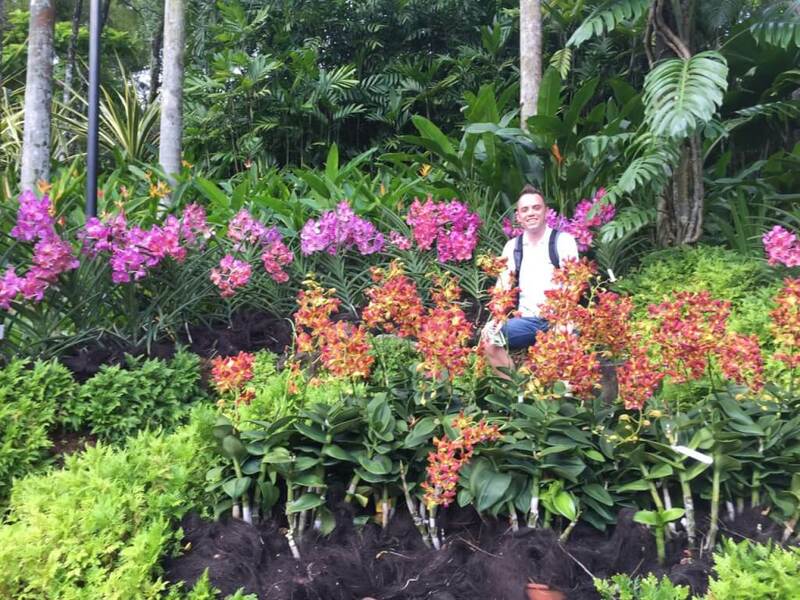 It doesn’t have to be the quickest route, you may want to lead the visitor to a feature first or past a specimen plant, but it must be obvious. As a rule of thumb, the minimum width of a path should be 90cm wide which is wide enough for bins, wheelchairs, wheelbarrows and access for two people to pass. This is the real difficulty with front gardens. As house prices have skyrocketed, space has become a premium. Mixed in with that people are now more mobile than ever with a car being a necessity for most people, whether it is for commuting or social necessity. There are simply more cars than most properties were designed for. In the 1970’s one car per household was a rarity, but now most adults in a residency with probably have their own mode of transport. That’s a heck of a lot of cars. What people have tended to do in the last 20 years is see their front garden as a car park, fair enough, nothing wrong with that. But us Brits have taken the need to park to almost fanatical levels with no garden feature being spared. Block paving, tegula paving bricks, flags and the dreaded sea of tarmac have now consumed huge swaths of our front gardens. More often than not the entire front garden is paved even when sections of it are useless for parking and become dead areas. It’s something the RHS have been campaigning about in their Greening Grey Britain campaign. With garden design, you can still have off street parking even in the smallest of gardens. What we designers implore you to think about is keeping the hard landscaping to a minimum in front gardens and to use porous materials than allow water through and wildlife to survive. Map out the exact size of space and turning circle needed for your car. Then plan how you can green the rest of the space! The biggest problem with paving over your front garden is water run off. Open soil, turf, flower beds and such all help retain moisture and then drain it at a slower rate. In fact, there’s actually no better man made alternative to slowing down the release of water other than soil and organic matter such as plant roots, leaf span and such. The image below shows how an entire garden has been bloc paved over. In the example there’s a full-length drive to the left which can fit 3 cars and then another three on the front you can see here. I would argue that this type of paving is complete overkill and unnecessary. Not only does it cost you more but it is very harsh to look at and means that water runoff and wildlife will be affected. During the awful floods of 2015, there has been a report that removal of trees from farming land has helped increase water runoff causing the flooding to be much more severe than it would have been. Slow the flow has reported that trees play an integral part of this and one Yorkshire town has already demonstrated this as a successful strategy. Now I’m not suggesting the flooding is because of paved front gardens, but it is clear that if surfaces, especially non-permeable, are being put in the place of gardens then the amounts of surface water runoff will significantly increase. This has a knock-on effect on storm flood defences, putting them under more pressure along with our ageing drainage network of Victorian drains in cities. Paving over also annihilates the chances of wildlife surviving in your front garden. Flags and tarmac have no organic value at all and retain little for anything to survive on, so whilst it may look clean it’s actually real bad news for insects, birds and wildlife. Flags and tarmac have no organic value at all and retain little for anything to survive on, so whilst it may look clean it’s actually real bad news for insects, birds and wildlife. A good rule of thumb is that in any garden space the most hard landscaping you should have is 2/3 and 1/3 soft landscaping, either plants, lawn or shrubs. Soft landscaping helps blend the garden to the harder materials, gives wildlife a habitat and can also keep the front of your house clean! Hedging such as Ligustrum ovalifolium (Privet), Buxus sempervirens (clipped Box), Prunus Spinosa (Sloes) or Carpulus betulus (Hornbeam) makes excellent hedges. Informal hedges only need clipping once a year with more formals such as box, requiring multiple clipping during the season. They also prevent litter and debris from being blown onto your drive or front step. The hedge below separates the grass border from the pavement keeping any debris out and adding some privacy to the front garden. Believe it or not, some plants are actually incredibly pollution tolerant and can absorb pollution from nearby roads and pavements. If you simply have a paved-over space this debris gets blown to your front door instead. The following are good solid choices for highly polluted inner cities. 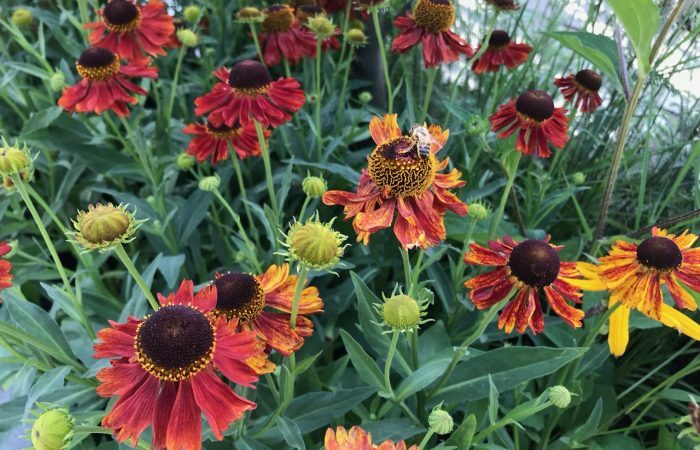 These plants are easy to grow, tolerant and super low maintenance. Front gardens that have been tarmacked or completely paved actually become massive reflectors for sound. Meaning that the busy road outside your house may start to sound even busier. Paving bounces off the sound and it then bounces off windows, brick work making the sound of passing traffic louder. 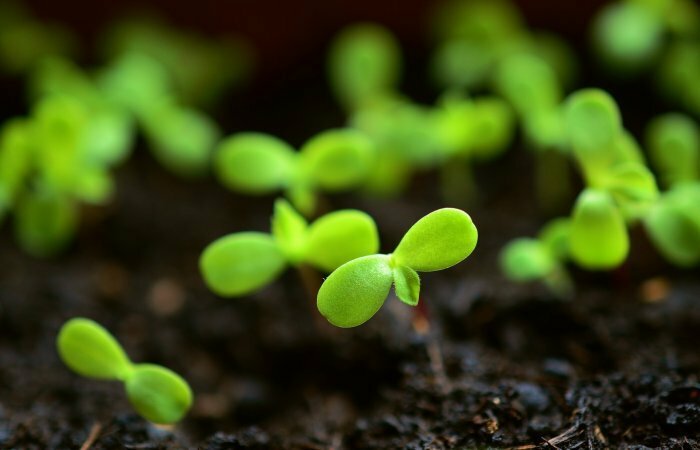 Planting, however, can help absorb some of that sound as the soil and planting diffuses and absorbs the vibrations better than hard materials do. The sound of grasses swaying in the breeze or the rustling of leaves on shrubs can be very soothing. So planting can actually be a really effective way of reducing road noise. Front gardens can really lift your mood, especially when returning home from a long day at the office. Mixing bright coloured flowers and shrubs can really lift the mood and design look of your house. Here are some ideas of what you could do with your front garden. Remember to consider access, parking and even seating. Given how fantastic your new garden would look seating is a consideration as you may now want to sit out and enjoy your green space. See how I designed ‘Fancy a brew? Take a pew!’ my award winning front garden for this very purpose. 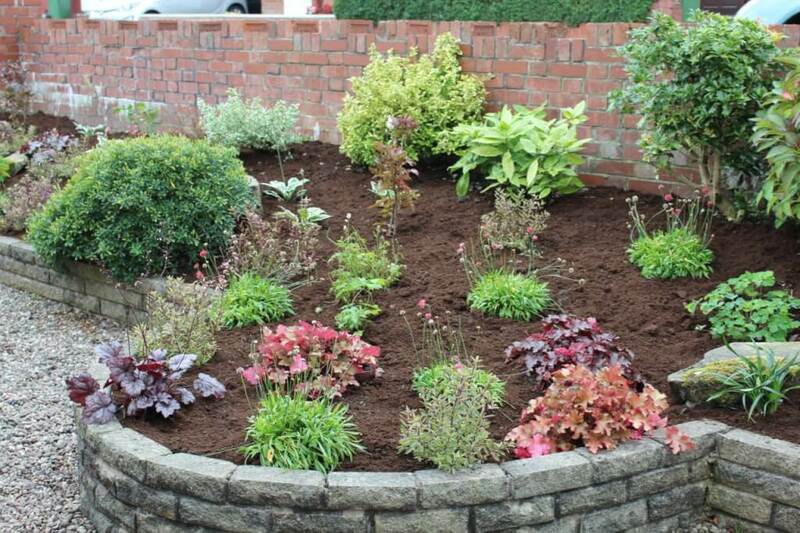 Looking at the photo below you can see how someone has turned a front garden border into a lovely lush cottage garden. In the summer months, this garden is in full colour with bee-friendly plants such as Lupins and Alliums for purple colour pops. In this garden shrubs are used for year-round colour. This also softens the front of the house. This would be a relatively high maintenance garden, seen by some of the spaces around the plants that have died back and not yet been replaced. Below is an example of a terrace garden and how you can pack in an array of cottage planting to give that relaxed yet exciting front garden look. Climbers and even a tropical Canna give texture and drama. This example features about 2/3 hard landscaping giving plenty of room for two cars and a garden area. The use of evergreens and topiary gives a sleep modern look. Yellow flag Iris gives a colour pop throughout the scheme. Low hedges screen off the front door and the Phormium tenax gives a some height through the access route. This garden may look very detailed but when you look at the plants chosen you can see how its actually super low maintenance. The use of Conifers, Viburnum and herbaceous perennials gives a real lush look but with minimal effort on the part of the gardener. The lawn is present but small enough to mow quickly. Again access is clearly laid out by the metal fence leading the front door, with planting screening and softening the brickwork of the house. The above is another low maintenance but high impact garden. Using evergreen shrubbery for year round structure but window boxes with brightly colour Chrysanthemums allows you to change the colour each season. Pots and containers are an excellent choice if your front garden is already paved over and your budget doesn’t stretch to hard landscaping. Container planting is an excellent way to get the gardening bug and is a nice progressive route to more adventurous gardening pursuits! It also means that you can move them around and change the schemes often and quickly. The above apple crates have been planted with annuals, plants that live and die in one season. They have been cleverly used to hide a drain. The idea could be applied to a front garden using the crates of different heights to add some greenery and planting to your garden! As you can see there’s so much you can do with you front garden other than bloc pave or tarmac it. Work out the exact space you need for your car, wheelie bins and then plan how you can green the rest. Not only will this welcome you after a hard day at work, but will help reduce water runoff, pollution and increase beneficial wildlife. Neighbours will become more chatty as a result and the feel good garden factor will start to flow! What are you waiting for? The adventure of your new green space awaits!